Hello: long time no postie?. It's been a full summer; strange too. I've had more changes in my life in the last 8 months than I've had in the previous 8 years, but that's subject matter for a different blog. Everything is fine, but my, how life can change on a dime. The positives are that my family and I are well, and my plate is full of great illustration jobs; work that I am truly excited about. More on that later. The other day I found a dead chimney swift in our alley. It broke my heart, as swifts are some of my very favorite birds. I await their arrival in our skies every summer. When I finally hear their rapid clicking calls and see their little cigar shaped bodies fluttering up high like bats, I know that summer is undeniably here. If you have never seen one up close, they really are amazing. Swifts have small, short legs unfit for perching like other birds, but perfectly adapted to clinging vertically to walls. In addition, their tail feathers have rachides (the central shaft of a feather) like stiff bristles that extend beyond the length of the feather and aid in their vertical, wall clutching ways. Their eyes are enormous dark pools; almost insect like. Before European settlers came to the North America, Chaetura pelagica were very numerous and roosted in the hollow cavities of large, ancient trees. We quickly pillaged our old growth forests, but almost as quickly swifts adapted to our urban structures. Instead of those old trees, they now roosted in our brick chimneys. And NOW we are tearing down, or sealing off our old chimneys. What's a good C. pelagica to do? The most recent issue of Audubon had a great feature about a lovely Texan couple that have been pioneers of Chimney Swift conservation. Paul and Georgian Kyle have figured out how to build swift friendly structures and have published their findings. Their very informative site is HERE.The site contains excellent information on Chimney swifts, as well as photos, videos, and pdfs on how to build one of their "swift towers". A great video of swifts gathering up at a chimney to roost for the night can be viewed HERE. Do you have Chimney Swifts in your town this summer? Don't know? Go out and look, silly. In the meantime, I'm putting up my little swift portrait in the STORE. no swifts unfortunately (being winter an all down here) Was a gorgeous day today, and i got to chase up an unfamiliar call, and found that some dabchicks had returned to our house dam - two males and a female - and given the amounts of flapping, calling and chasing they are predicting an early spring. Still waiting on our black swans to return to our swan dam. And on another note, my new(ish) golden laced wyandotte chickens have started laying. Love having chickens again. We have Chimney Swifts nesting in our chimney at work. I discovered a hungry chick in the fireplace a couple weeks ago and unfortunately had no way of returning it to the rest of the family, so I brought it to a rehabber. I love watching their little cigar butts darting across the sky! I was home one summer and some chimney swifts had gotten caught in our flue. My father called various agencies until he found one that promised they could free the birds without harming them. My father came home that night, and sure enough, no more swifts in the flue. But he was heartbroken to find seven dead swifts at the base of a nearby tree. He was completley broken up, and certainly felt responsible, so he went to find a box to give them a proper burial. When he lifted the first he noticed some movement. The others responded to touch as well. Animal Control was enlisted and they came with a rescue team. We never followed up on the birds -- I think we were afraid what we'd find out -- but I've had a soft spot for swifts ever since. Thanks for the lovely visual reminder! Thanks for checking in, people. 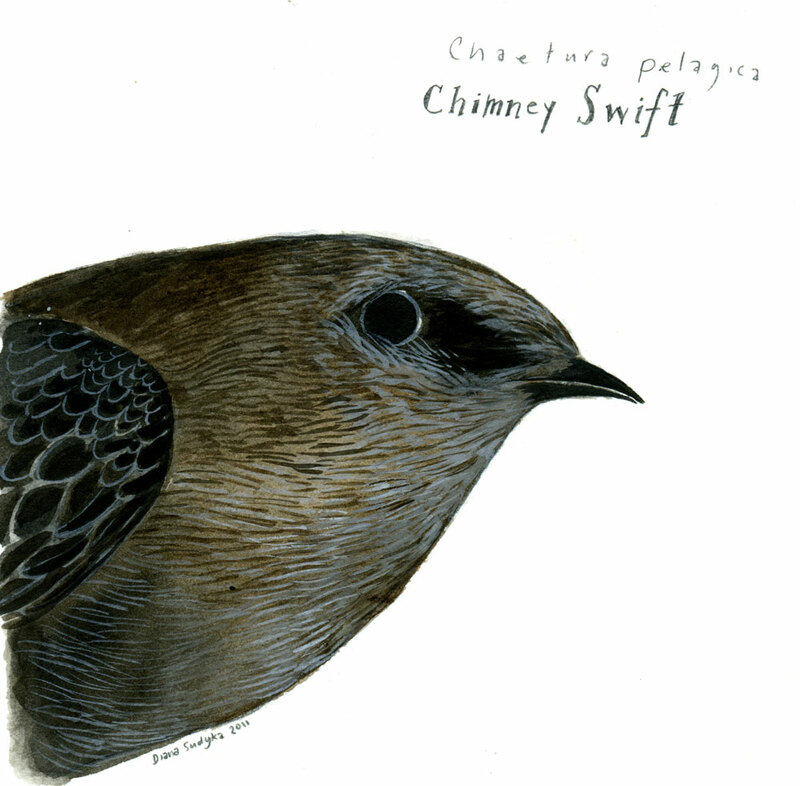 It's interesting (and unexpected) to hear that some of you had first hand experiences with Chimney Swifts. I am not sure what the survival rate is for young swifts in wildlife rehabilitation, but because of the research that this couple in Texas has done, it is much better than it used to be. They discovered after trying to take care of young swift chicks (and failing) that they needed the antibodies present in the adults' saliva. Chicks in the wild would get this when the parents would feed them, of course. In wildlife rehabilitation, by swabbing a bit of saliva from an adult and giving it to a young chick, they saw survival rates skyrocket . I *think* this not only true for swifts, but for other species of birds as well; standard knowledge now amongst wildlife rescue workers. That's interesting about the saliva. I've never heard that, but it makes sense. I worked in wildlife rehab for a couple years, but we didn't get swifts often. One of the biggest mistakes people make with swifts is that they try to put them horizontal on a perch like perching birds. But swifts need to be vertical, they need a brick or something similar in their cage so they can cling to it with their sharp nails and perch upright. Yep - that's the article I was referencing in my post. The Kyles were the ones that figured that out about the saliva, and are also behind the site and Texas sanctuary that I link to. That's great that you were involved with wildlife rehabilitation. I'm not surprised that you didn't come across too many swifts, and can understand the mistake well intentioned people would have about the perching issue.